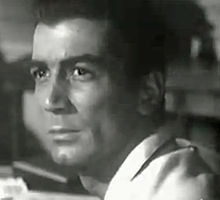 Ray Danton (born Raymond Caplan; September 19, 1931 – February 11, 1992), also known as Raymond Danton, was a radio, film, stage, and television actor, director, and producer whose most famous roles were in the screen biographies The Rise and Fall of Legs Diamond (1960) and The George Raft Story (1962). He was married to actress Julie Adams from 1954 to 1981. Danton was born Raymond Caplan in New York City, the son of Myrtle (née Menkin) and Jack Caplan. His family was Jewish, and he was a descendant of the Vilna Gaon. Danton entered show business as a child radio actor on NBC radio's Let's Pretend show in 1943. Danton did many stage roles whilst attending the University of Pittsburgh and Carnegie Technical School and in 1950 went to London to appear on stage in the Tyrone Power production Mister Roberts. Danton's acting career was put on hold when he served in the United States Army infantry during the Korean War from 1951–1954. Danton made his film debut in Chief Crazy Horse in 1955 and became contracted to Universal Pictures His second film I'll Cry Tomorrow led to his typecasting as a smooth but dangerous villain. His third film for Universal The Looters was where he met his future wife Julie Adams. He was prolific in television work as well as film where he received the Golden Globe Award in 1956 for the new male star of the year in film. Beginning with Onionhead Danton worked with both Warner Bros. film and Warner Bros. Television This led to his most famous role The Rise and Fall of Legs Diamond where he played the eponymous gangster for director Budd Boetticher. Danton played his role using dynamic body language with his smooth persona fitting the character like a glove. Danton reprised the role in Vic Morrow's Portrait of a Mobster. Danton maintained his gangster persona with the title role in The George Raft Story, a screen biography of 1930s actor/dancer George Raft. "I guess I'm the last of the big time gangsters," he said in a 1962 interview. Danton starred in Tarawa Beachhead in 1958, with co-star Kerwin Matthews, and his off screen wife, Julie Adams. That year Danton also guest starred in Yancy Derringer as a Spade Stuart, a hired killer. In 1959, he guest starred in the episode "The Meeting" of Bruce Gordon's NBC docudrama of the Cold War, Behind Closed Doors. Danton played American agent Ralph Drake who is sent to Austria to meet with western agents from six Iron Curtain countries after it is revealed that the Soviet Union had named a new head of the secret police. In 1960, Danton and Ron Foster were cast as Kane and Tommy Potts, respectively, in the episode "Bounty List" of the ABC/Warner Brothers western series, Colt .45. He also appeared in the ABC/WB western Lawman and the crime drama series, Bourbon Street Beat and The Roaring 20s. In 1961, Danton co-starred with Rosalind Russell, Alec Guinness, and Madlyn Rhue in A Majority of One. He was a semi-regular on the ABC/WB adventure series The Alaskans and made several television pilots playing spies, such as Big Time (1957), Solitare (1961) for Warner Bros, and Our Man Flint: Dead on Target (1976). On October 9, 1962, Danton appeared as the gunfighter Vince Jackson in the episode "The Fortune Hunter" of the NBC western series, Laramie. In the story line, Jackson is a suave but nefarious suitor for a young woman, Kitty McAllen, played by Carolyn Craig, whom he plans to marry in order to extort money from her wealthy father, Fred McAllen, portrayed by Parley Baer. However, series character Slim Sherman, played by John Smith, has his own interest in Kitty who is using Vince's alleged affections shrewdly to make Slim jealous. Ultimately, Kitty leaves Laramie to attend college. He also guest starred in the NBC western with a modern setting, Empire and its successor series, Redigo, both starring Richard Egan. In 1964, Danton was cast as Jere Fryer, the suitor of Pauline Cushman, the former Union Army spy played by Paula Raymond in the episode "The Wooing of Perilous Pauline" of the syndicated western television series, Death Valley Days. In the story line, set in Casa Grande, Arizona Territory, where the feisty Miss Cushman was operating a saloon, Fryer makes a $100 bet with a friend that he can convince her to marry him within a week. In the mid-1960s, Danton alternated between American television series and European films such as Code Name: Jaguar and Secret Agent Super Dragon, including a 1970 Hawaii Five-0 episode "The Last Eden" (as bellicose Hawaiian singer Jimmy Nuanu). He formed a production company in Europe producing films like The Last Mercenary and began directing with Deathmaster (1972) and Psychic Killer (1975). Danton continued directing as well as acting and started producing films such as Triangle in 1971. He guest-starred in an episode of the 1974 ABC police drama Nakia, and a 1974 Hawaii Five-O episode "Steal Now, Pay Later". Danton directed many episodes of Magnum PI in Season 8, 1988-1989. Danton was married to actress Julie Adams from 1954/55 until their divorce in 1981. They had two sons: assistant director Steven Danton (b. 1956) and editor Mitchell Danton (b. 1962). Danton died of renal failure in Los Angeles, California. ^ "Laramie: "The Fortune Hunter", October 9, 1962". Internet Movie Data Base. Retrieved January 2, 2013. ^ "The Wooing of Perilous Pauline on Death Valley Days". Internet Movie Data Base. Retrieved August 6, 2015. ^ "Actress Expects November Baby". The Daily Interlake. May 6, 1956. p. 17. Retrieved September 11, 2015 – via Newspapers.com. ^ Official Julie Adams website, julieadams.biz; accessed July 5, 2016. ^ Profile, TCM.com; accessed July 5, 2016. Wikimedia Commons has media related to Ray Danton.